Use the form below to inquire about Exclusive Jungle Resort at Lakkidi . Use the form below to reserve for Exclusive Jungle Resort at Lakkidi . These Villas have large balconies, sunken living room, a bedroom, a plunge pool and a jacuzzi. These villas have a sunken living room, a bedroom, and a children's room on the first floor with an attached balcony. They also have private pools. The tree house has thatched roofs and bamboo walls. Uses solar energy. These are individual cottages, ideal for a family. It has a living room, bedroom, bathroom with a jacuzzi a sit out and a verandah. The exclusive Jungle Resort at Lakkidi is a treasure trove of natural beauty and your gateway to the lush tropical rainforest in Wayanad. Any chance to get intimate with nature in this lively, verdant ecosystem is an opportunity to make every breath of your life count. Within the dense canopy of the forest on the rugged ridges of Wayanad are ensconced some of the most beautiful species of plants, magnificent waterfalls, crystal clear freshwater streams, and other spectacular delights that will enthrall you. 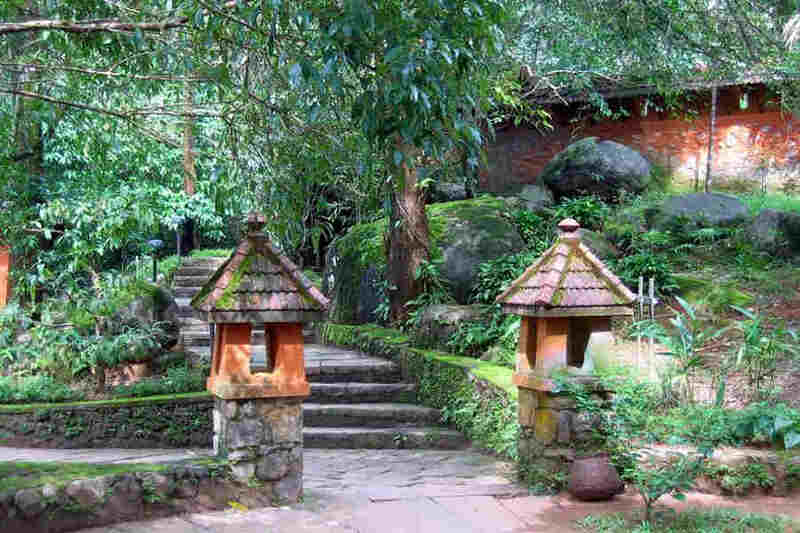 Nestled amidst this luxuriant landscape is Vythiri, a tiny hamlet that is a paradise for nature lovers. This Jungle Resort at Lakkidi gives a new dimension to traditional luxury in the jungle with its world-class services and state-of-the-art accommodation that epitomizes lavishly pampered living. Spread on a sprawling 150-acre property, the resort has six Honeymoon Villas, four Honeymoon Pool Villas, three Pool Villas, Independent cottages called Vythiri Haven, and five Tree Houses. The Honeymoon Pool Villas are duplex villas, each with its own sun deck and private swimming pool on one floor and a glass-floored bedroom and a living area on the floor above. Set along one of the streams that flow through the resort, the Pool Villas are also duplex villas with a sunken living area, a separate bedroom for the children and the adults, and a private pool. The Honeymoon Villas are spacious dwellings with a stylish sunken living area, a bedroom, a large balcony, a plunge pool, and a jacuzzi in the ensuite bathroom. The independent cottages at the resort are perfect for those seeking some extra privacy. Away from the other types of accommodations, the Vythiri Haven cottages feature huge rooms and sit-outs, a grand bathroom equipped with a bathtub, and the forest all around. For those who seek adventure, the Tree Houses make for perfect abodes, set high up in the thick forest canopy. The quaint Tree Houses, one of which is child-friendly, feature bamboo walls and thatch roof and are equipped with minimalist yet charming comforts for a cozy stay. All the villas and cottages are well-furnished and equipped with all the modern amenities to make your stay comfortable and memorable, whether you’re staying for a day or for a longer duration. One thing that’s common across all the types of accommodation at this exclusive Jungle Getaway is enchanting views of the rainforest. Peace of mind and constant chirps and birdsong are also guaranteed during your stay at the resort. As far as food is concerned, the multi-cuisine restaurant at the resort will keep your appetite and cravings in check with the delicious fare the chefs serve during every meal and in between. Buffet meals at breakfast, lunch, and dinner are included. All applicable taxes are included in the room rates. The stay is complimentary for two children below 5 years provided they are staying on a sharing basis with parents. This does not apply in Honeymoon Villa and Honeymoon Pool Villa. The general check-in time is 1 PM and Check-out time is 11 AM. The check-in time for tree houses is 2 PM and 11 AM is the check-out time. Due to logistical constraints, guests will be permitted to carry only a limited amount of baggage to the tree house. Please transfer personal items that are absolutely essential for the duration of your stay into a small bag to take with you. The rest of your luggage will be kept safe at the reception and handed over on your checking out from the tree house. Cancellation or amendment of booking up to 30 days before the check-in date will incur 10% of the total booking amount. Between 30 to 15 days before the check-in date, cancellations and amendments will incur 50% of the total amount for the booked period. Amendments or cancellations made less than 15 days from the date of arrival will incur 100% of the total billing amount. Amendments or cancellations are not allowed during festival holidays and from 21st to 31st December. It is hard to resist going out when there’s so much to be explored in the wilderness of the rainforest in Lakkidi. The resort arranges guided treks to the surrounding forest to get the guests acquainted with some of the inhabitants of the area. With the help of the naturalist who accompanies every trek group, you could be able to spot the Malabar Giant Squirrel, Nilagiri Langur, Yellow Browed Bulbul, Malabar Grey Hornbill, different varieties of butterflies, and many more stunning creatures prevalent only in the Western Ghats. While you’re at the property, you can participate in morning sessions of meditation and yoga or indulge in a leisurely walk around the resort anytime during the day. There are many trails that wind through the rainforest and look ever so inviting to cyclists of all grades. You can also learn a thing or two from the culinary demonstration that the resort organizes for its guests. For those who crave some activity, there’s a health club where you can break a sweat and a games room with an array of games lined up for you. If you’d rather spend your holiday relaxing in one of the nooks and crannies of the resort’s expansive property, you have plenty to do too. For starters, you can laze in the resort’s swimming pool or check out the natural pool that adds to the natural beauty of the resort. Then head to the spa or the Ayurvedic center to revitalize your body and rejuvenate your soul with a soothing massage. Grab your reading material and visit the resort’s coffee shop for a hot cuppa, or just look around in between sips of the hot brew and embrace nature’s glorious vastness that the resort has preserved quite efficiently. Wayanad does not have an airport. The nearest airport from the property is the Calicut International Airport, located at a distance of about 85 km. The international airports at Mangalore and Bangalore are located at a distance of 270 km and 360 km, respectively, from this jungle getaway resort. Wayanad does not have a railway network either. If you are planning a trip by train, the nearest railway station is in Kozhikode aka Calicut (63 km). The railway stations at Thalassery (110 km), Kannur (130 km), and Mysore (190 km) are your alternatives. All these stations have good connectivity to other parts of the country through regular trains. The resort is well-connected to Calicut city (65 km) and other cities by a network of various national and state highways. While it is 270 km from Bangalore and makes for a great road trip through the forested Bandipur National Park, it is only 165 km away from Mysore and 130 km from Ooty. Other cities from where a great road trip to the resort is guaranteed include Coorg (140 km) in Karnataka, Coimbatore (210 km) in Tamil Nadu, and Cochin in Kerala (230 km).